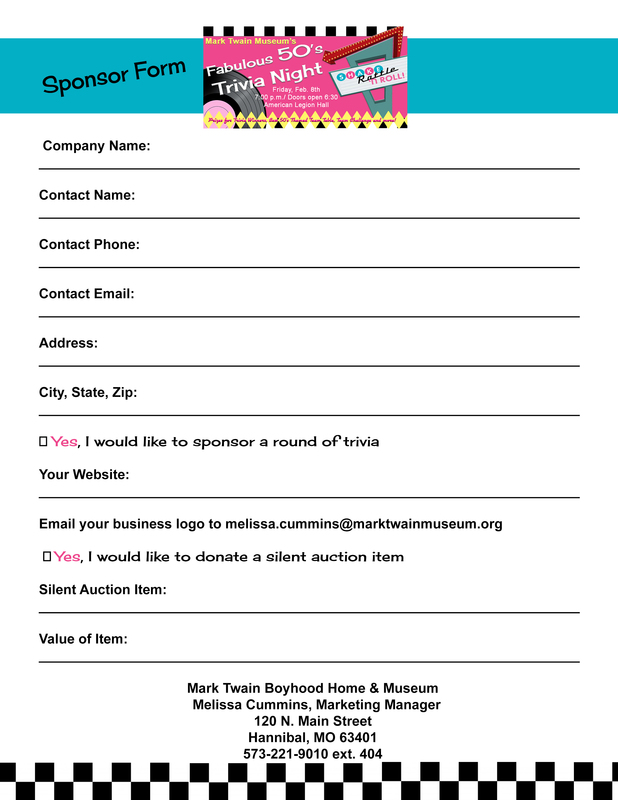 Get ready to Shake, Rattle ‘N Roll at the Mark Twain Museum’s Eighth Annual Trivia Night! Cruise on over to the American Legion Hall, Hwy MM, Hannibal on February 8th for an evening dedicated to the Fabulous Fifties! $100 cash prizes awarded to the Winning Team and also to the “Best” 50’s themed team table! So don those 50’s threads, bust out those pony tails, jelly rolls and leather jackets. Doors open at 6:30 p.m. with rounds of trivia beginning at 7 p.m. Fabulous Fifties Trivia Night also includes a free team challenge, 50’s fast rounds, a 50/50 raffle and silent auction. Trivia teams consist of up to 10 players per team at $10/10 members or $100 team entry. Teams compete in 10 different categories dedicated to the Fabulous Fifties. 10 questions per each round. Prizes to the first-place team, winners of the team challenge and fast round winners. Donations for the silent auction as well as sponsors for rounds of trivia are needed. To register your team, donate items to the silent auction or sponsor a round of trivia for $100, contact Melissa at 573-221-9010 ext. 404. 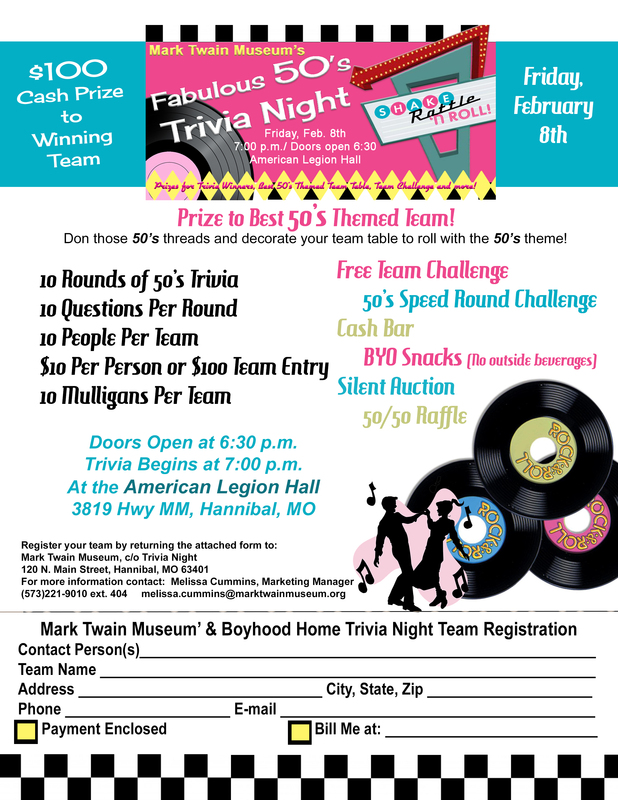 So gather up all your hip friends, don your best 50’s threads, grab your favorite snacks, and cruise on over to the Mark Twain Museum’s Annual Trivia Night. Beverages available for purchase at event.